You could think about moving the waypoints one by one and rescale the animation manually. Although it is possible, for the majority of the times it would be tedious and fruitless. With Synfig it is easy to do. First of all you need to group the layers that are going to be rescaled in time. We'll need to make use of the Time Offset Parameter of the Group layer. For example, say we want to rescale from [A-B] to [C-D]. So what we want is that when the original animation reaches the A time then the new animation would reach it at time C instead. Similarly for B and D. But if you move the animation in that way, what happens to the frames before frame A that are now before C? And what happens to frames after B that are now after D? Unless precautions are taken, they're rescaled too. Is that what we want? In the most general case we would like the frames 0f to A' (A'<A) and B' to the end of the animation (B'>B) to be untouched. Frame C must be smaller than D.
Now we know what are rescaling, then let's modify the animation to make those changes on it. At frame A', insert a value of 0f. This will maintain this frame untouched (and the ones that are before also, if there are no more waypoints there). 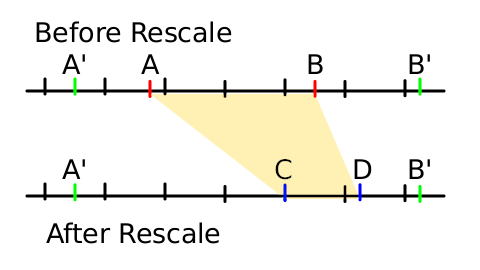 At frame B', insert a value of 0f. This will maintain this frame untouched (and the ones that are after also, if there are no more waypoints there). IMPORTANT: all the inserted waypoints must have linear interpolation. If not, you will change the original timing of the animation. To make it easy, just select Linear on the default interpolation parameter on the tool box window. From A=C to B, the rescaled animation is slowed down to reach B position at the same time the original animation reaches D. So the time segment [A-B] is rescaled to [C-D]. We've enlarged the time segment so the rescaled animation is slower. From B to B' the rescaled animation accelerates to reach the B' mark at the same time than the original. We've shortened the time from B to B' so the rescaled animation is quicker. It was done by setting the waypoint in the frame D to 0f, which forces the rescaled animation run to reach the original animation. From B' to the end, the animation is the same. Both the original animation and the scaled animation use linear movement, but the scaled animation is done in three linear steps. In the original animation (black circle) the time and the position are the same. Hopefully this clarifies the example. Fix links to other wiki pages. Include an animation sample (in progress). Insert a table with the waypoints (time and value) of the offset parameter.